ALAN Stubbs has assured Hibs fans that he has had no contact with anyone at Dundee United and says he has no idea where stories linking him with a switch to Tannadice originated. However, the Leith club’s head coach did not definitively rule himself out of a move to Tayside and a shot at managing in the Premiership. “I have a job to do here at Hibs and nothing has changed,” he said. “The one thing is that the story has not come from anything close to me. I can’t stop things from going out there as that is the nature of football. Hibernian currently sit in fourth place, 11 points adrift of Championship leaders Rangers, increasing the likelihood of the play-offs providing their only prospect of promotion. But Stubbs’ stock remains relatively high in the game and he is one of several names in the reckoning to replace ousted Tannadice manager Jackie McNamara. Others include Scotland assistant coach Stuart McCall, who pitted his wits against Stubbs in last season’s Championship play-offs, as well as former Easter Road bosses Mixu Paatelainen and John Hughes, who won the Scottish Cup with Inverness Caledonian Thistle last term. Stubbs says he will remain focused on preparing his men for tomorrow’s match away to Queen of the South, hoping to guide the team back to winning ways after last weekend’s draw at home to St Mirren. He does see the merits in the Tannadice position, though. “I am very ambitious and it is a very good job for someone,” he said. “Dundee United have some good players and there are some decent youngsters at Tannadice. “I am at a big club in Hibs and I was given a good opportunity and we want to get promoted out of this division. I respect Dundee United as a club but I respect Hibernian football club as well and I don’t know where the story has come from. I have to answer questions on the back of being linked with the manager’s job but there is nothing to say really. “I’m just disappointed that I am talking about all of this because my pal has lost his job. I am disappointed for him and unfortunately that is the business that we are in. 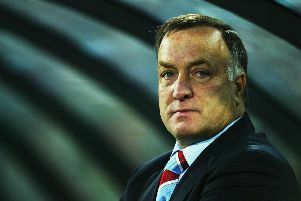 “Football management can be very ruthless at times and it’s a results-orientated business. Unfortunately for Jackie he has lost his job and now the position is available for somebody else. Dundee United chairman Stephen Thompson has made it clear he is in no rush to make an appointment but did say he wants a man with experience, which could rule out a manager who has never managed in the top flight. That would leave Stubbs with a plan to see out at Easter Road and a gap to start trying to claw back this weekend.